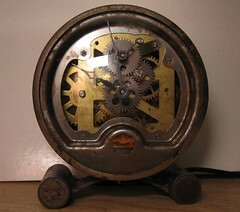 This started out as a rather beat up alarm clock I purchased at some sort of rummage sale in the past. It was neat, but ultimately pretty ordinary looking; old, but not antique (1950s, at the earliest). As a result, it spent the last few years collecting dust in the basement-only getting looked at passingly and never wound. I’d been home from university that week (for the Thanksgiving holiday), and had been quite bored. All my good tools, toys, PC, etc were still at school, so I was left to putter about the house. While meandering through my vast piles of junk, the clock caught my eye. When I opened the cheap metal casing, a gorgeous arrangement of brass gears twinkled before me. I though about tearing it apart and harvesting the wondrous cogs, but decided it was much better intact. Still, what could I do with it? As I poked around the gears and levers, I found something wonderful: the clock’s face was but mere cardboard and when removed, left the internals visible to all! It also revealed the unbelievably perfect patina on the steel body of the timepiece-a definite requisite for steampunk! I also added a small incandescent light inside to better illuminate the meshing gears and oscillating wheels. I am aware that, as a nerd, it is my solemn duty to use LEDs wherever possible, but they just couldn’t give me the warm glow i was looking for. I instead opted for a “grain of wheat” bulb (the LED’s great grandfather) I had kicking around. I’m running it slightly under-volted which does two things: 1) it keeps the bulb cooler, lengthening its life 2) gives off a warmer, more orange light. The bowl-shaped bell (for the alarm) is located right under the most interesting gears in the clock, so it made a perfect reflector for the bulb. The spring that would power the alarm portion of the clock was broken (and most of it missing), so i was able to to do this without consequence. The bulb is powered by a AC adapter from an old Visor Prism PDA, which supplies it with 5.9V (nice number, eh?) and 1A. As you can see, it plugs into the back via an added-on 3.5mm phono plug pair. Tools: Screwdriver, soldering iron, razor blade (paint removal), drill, and sandpaper. Keep this stuff up, if you do you will turn into one of my favorite blogs. I would like to try and make one or similar to it for a christmas present. Do you know what the clock maker was or name of the model it was? Any help would be greatly appreciated.